Ever since reading The Soul of a New Machine, Tracy Kidder’s Pulitzer Prize-winning account of the creation of a 32-bit minicomputer, I’ve been a hound for any such works offering behind-the-scenes looks at such periods of silicon genesis. They are, to me, the very most interesting things to read. Over the past decade, I’ve found and enjoyed quite a few such stories regarding a variety of platforms and technologies. Of course, not every system of my personal interest has been covered in this manner. 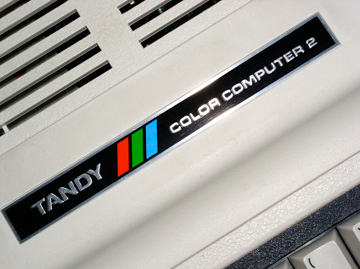 One of those without a nice, public genesis chronicle is the Tandy Color Computer, which is a platform I added to my own collection only recently. I’m pleased to report that this won’t be the case for long. Notable CoCo-scene personality and all-around super-nice guy Boisy Pitre, who I recently covered here in regards to his fascinating Liber809 project, has partnered with video game historian Bill Loguidice from Armchair Arcade to bring forth a book chronicling the history of the Tandy Color Computer. Pitre and Loguidice have interviewed many individuals from the old days at Tandy, including all members of the CoCo engineering team, in order to render what will surely be a most fascinating history of of a machine that certainly deserves to have its story told. It seems that Pitre and Loguidice are aiming for a release at the end of this year, and I’ll let you guys know when it lands. I’m very much looking forward to it. This entry was posted in News, Tandy / TRS-80. Bookmark the permalink. Don’t forget ‘Racing the beam’ for an equally fascinating look at the VCS. ‘Piloting Palm’ is a good book explaining how the Palm PDA came to be. Looking forward to this book very much. Also still want to read “Racing the Beam” as well.